Over the summer a number of friends gathered at High Lindrick Farm in North Yorkshire. We were blessed with mostly fine weather in very comfortable surroundings. The particular focus of our time together was ‘The Dusty Covenant’. Our guest speaker was Derek Carlsen from Chicago (USA). He addressed us for five successive mornings and then invited informal feedback & further discussion throughout each day. It was a rich blessing to be under one who had cut his own teeth under the tutelage of none other than Dr Greg Bahnsen!! 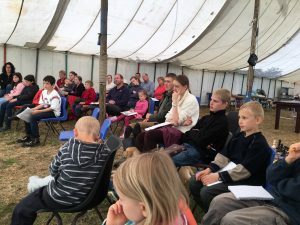 Jason Lawton spoke to us on Thursday asking the question, Might it be that our evangelism has been GENERALLY so ineffective because we have reduced the content of the gospel from a comprehensive worldview to a ‘fire and life insurance policy’? Stephen Perks finished off our week with an exhortation for the Christian Church to become a distinctive ‘Social Order’. The messages are made freely available below. As the logo of Christian Liberty Press reminds us (so nobly purloined from the Jesuits! ), “Ad maiorem Dei gloriam”. Next Do you Love Jesus Christ?